When I go to work on Fridays, I usually have no idea what kind of cakes I get to make that day. Some are more intimidating than others and some are just plain fun. The Volkswagen Hippie cake was in the fun category! Who doesn’t love throwing on random hearts and flowers onto a cake. Not to mention that the hippie van shape is pretty straight forward, so not to difficult with covering in fondant. Then all you have to do is add the love! Love Erna’s Cake creations? You can see more HERE. Also, be sure to check out our CAKE board on Pinterest. Erna is a happily married stay-at-home mom to three beautiful children. She fell in love with decorating cake after taking some local decorating courses. She is a hobby baker and decorates her creations for her family and friends. Erna continues to do what she loves by working a few hours at a local bakery. This is so awesome! My husband would adore one of these for his birthday!! That is such a beautiful and cool cake! Love the picture! so cute, luv the VW bus! Love this cake its so cute! I love this cake, it reminds me of Scooby Doo. Omg ! Amazing! You are so talented! That is the coolest cake I have ever seen!!!! Nice Cake! I’ve not made a Cake using fondant before, I always just use Butter cream Icing but love making Flowers, Animals or just Fun Shapes or Patterns on my Cakes. What a great job you did on the cake,I’ve never used fondant before . This cake looks so amazing. Fondant never works out for me. So cute! My hubby would love this! Mmmmm, I love the look of fondant and if it’s homemade it tastes so good! Wow that is a really awesome cake! Love it! Wish I could make things like this! This is awesome! What a great job on this cake! so cool, very talented in cake making. omg I love this……my son is a big Scoooby Doo fan and this reminds me of the Mystery Machine!!! That cake is sooo cute. My hippie family would go nuts over it. This is indeed a cool cake. Wow that looks great, I’ve always wanted to get into cake making. Love the cake, my kids are looking for a real one so they can tour around. what next a ford focus cake….neat and creative…would hate to eat! omg that is too precious!! Fascinating! I’ve always thought these vans were so cool so I love the looks of this cake! This cake is way too cute! this is awesome! I would love to make this for my dads birthday! I know someone who would LOVE this for their birthday! fun cakes are always the spotlight of a party! OMG – I love this. Very detailed. I wish I could decorate cakes like this. My neice makes a lot of fun cakes for birthdays and special days. This cake is so cute! OH WOW how amazing !! that is the coolest cake ever ! wish I had some talent for these kind of things . So Hippie looking…brings back a few good memories. This is amazing. I can’t even imagine how long this must have taken!!! What a cool cake! Love the colours on it! This cake is so adorable and I am sure the customer really enjoyed receiving it. It made me think back to the sixties when I was a young teen and having a fun times. My hubby would love this cake for his birthday! Gorgeous! That is so cool, I have always wanted to be able to decorate cakes, but my cakes don’t turn out so good lol. Where did you learn how to do such awesome cakes? Thank-you! Many hours were spent on you-tube and other online tutorials, as well as lots of practise! i haven’t seen a hippie car or van in a while! This is so cute and reminds me of one I saw quite frequently when I lived in my hometown! Cool cake! My nephew has a Westphalia (sp) – this cake would be awesome for him! This is a very cute cake, the van reminds me of the van on Scooby Doo, very nicely done. Thank you for this groovy post. When I saw the title of the post I wondered what the heck? But now I see it’s such a cute cake! Love the design.. Such a fun and neat cake! We usually go with the traditional cakes but my kids would probably go crazy for cake like this! It’s so different from our usual that’s for sure. What a cool cake! It’s too cute to eat! Wow this is quite a cake, so cool and I love it. 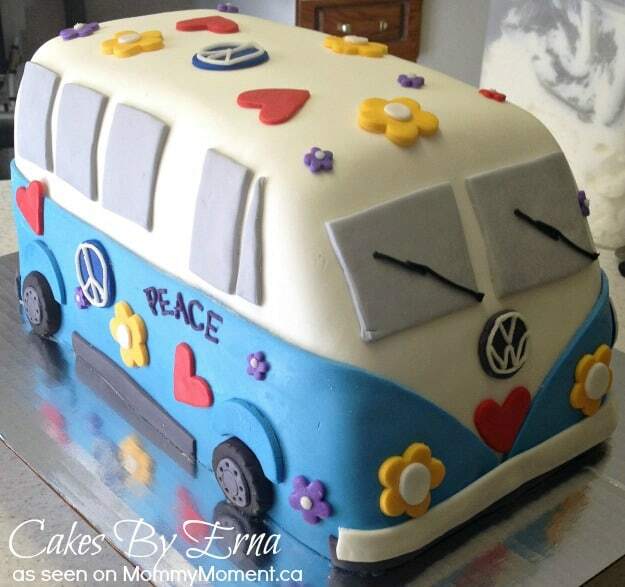 My older cousin had a Volkswagen van just like this, I would love to present them with a cake like this as it would bring back a lot of happy memories. This is a really cool cake. This is a neat hobby to have. Love this cake! Its perfect for any Hippy in any family! That is the cutest cake I have seen. Love, love, love it. Thanks! I’d like to take credit for the idea, but it was a request from the client. What an AB FAB cake!! Perfect for any flower children (baby boomers) having fun bday parties! That’s so awesome! Would never have thought of doing something like that – truly amazing. That is so cute! I wish I could make cakes like that! Brings back some childhood memories for me. Love, love, love this cake the hippie van is my all time fav. i use to love to do these projects with my younger sister at 15 years years now shes going through the stage of rather doing her own thing. Oh gosh! My brother would love this. I’ve never worked with fondant – do you like it? Yes, I like working with fondant. I find it easier than buttercream! I love hippie vans so much my husband said he is going to buy me one, so when I seen this cake I absolutely fell in love with it! !